Northwestern’s Center for Innovation in Global Health Technologies tailors medical diagnostics to meet life-or-death challenges in the developing world. For parents living in rural African villages, getting their newborns tested for HIV is not only a struggle, but also a race against time. For them and all parents of the 1.4 million babies born each year to HIV-infected mothers—who can pass the infection on during pregnancy, childbirth, or breastfeeding—getting reliable test results in a timely manner is literally a matter of life and death. It’s hard to believe that in the 21st century, children’s lives hang in the balance because of a logistics issue. In rural Africa, however, the issue is alarmingly and devastatingly real. There, central laboratory testing often adheres to a monthly schedule; drivers pick up blood samples from the surrounding area clinics just once per month. The samples travel sometimes two weeks before arriving at the laboratory. After testing, results return to the clinics on the same monthly schedule. If roads flood or conflicts break out, results take even longer—or never return at all. 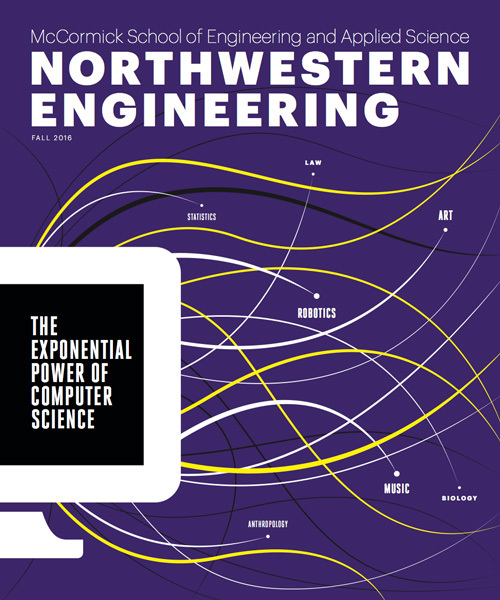 “It can take several months of waiting,” says Northwestern Engineering’s Matthew R. Glucksberg. “Babies don’t have the immune systems to wait that long. These tests were not designed for this type of environment or infrastructure.” He adds that nearly 50 percent of test results never even make it back to the originating site. A professor of biomedical engineering, Glucksberg leads Northwestern’s Center for Innovation in Global Health Technologies (CIGHT), which is actively developing faster, cheaper, and more accessible diagnostics for infant HIV, HIV viral load, tuberculosis, and hepatitis C. The Center works closely with the Northwestern Global Health Foundation to commercialize these devices and move them into clinics. Because traditional biotech companies have difficulty making devices for the developing world profitably, Northwestern faculty created the foundation as a new nonprofit model to commercialize technology for those who need it most. Here are some examples of how the CIGHT team uses innovation tailored to developing countries to save lives. Cheap and fast HIV tests for adults already exist: they require only a drop of blood and 15 minutes to produce an accurate result. Unfortunately, these tests cannot be used for infants. The LYNX HIV p24 antigen test developed by Northwestern Engineering’s David Kelso, clinical professor of biomedical engineering, detects the actual proteins from the virus in infant blood samples. Kelso’s test delivers accurate results in under an hour, while the parents wait. The testing device, the size of a toaster, is powered with a rechargeable battery and fits into a backpack for easy transport to rural settings. The test needs only three drops of blood, easily collected from a baby’s heel. Plasma is separated by a passive filter, eliminating the need for a costly centrifuge. Results can be read visually. One line on the paper test strip indicates a negative result, two lines a positive. Cost is $7 to $15 per test and $700 to $2,000 per testing device compared to other point-of-care instruments, which range from $25,000 to hundreds of thousands each. The Northwestern Global Health Foundation has agreed to manufacture and raise money to scale the device. Viral load refers to the amount of HIV in a blood sample—critical information for HIV patients. A high viral load means that their current dose of antiretroviral drugs—if they are taking them at all—is ineffective, and that the virus is healthy and replicating in the body. People with a high viral load are more likely to pass the virus along to partners and offspring. To monitor HIV patients’ health and the efficacy of treatment successfully, physicians must test viral load on a regular basis. In Africa, a physician shortage plagues the clinics, which are few and far between. Patients are often unable or unwilling to make distant round trips for testing and again for the results. The CIGHT team developed an HIV viral load test that delivers results within 60 minutes. Test results can be available quickly while the patient waits. Daily throughput is 13 tests per eight-hour shift. Quidel Corporation has agreed to manufacturer the HIV viral load test for use on their Savanna Molecular Platform, which is in development and expected in the next 12 to 24 months. the world has latent tuberculosis. Most can live long, healthy lives without needing testing and treatment. If their immune systems struggle, however, tuberculosis can transform from latent to active. Medical personnel find working with active tuberculosis samples very difficult. Instead of testing easy-to-access fluids, such as blood or urine, they can only detect active tuberculosis in a patient’s sputum, a mixture of saliva and mucus coughed up from the lungs as an immune response to respiratory tract infections. After a patient produces a sample, also tricky, the sputum is liquefied, examined under a microscope, and grown in a petri dish, which can take months. Because active tuberculosis is very contagious, samples require careful handling to prevent contaminating the lab. Some physicians attempt to bypass the lengthy and dangerous culture process by diagnosing tuberculosis using lung X-rays. If patients come in early enough, tuberculosis presents itself in a distinctive position: the lung’s upper right lobe. If they fail to come in early, it’s a different story. More HIV patients die from tuberculosis than any other cause. Because they are among the most vulnerable, they can be tested for active tuberculosis at the same time as their HIV viral load test- ing, saving them multiple visits to different sites for different tests at different times. This offers patients a one-stop shop that not only expedites results, but also speeds the start of treatment. While most active tuberculosis tests are 40 to 70 percent sensitive, preliminary results show that CIGHT’s sensitivity is greater than 95 percent—meaning it diagnoses positive cases correctly 95 percent of the time. Results are delivered in one hour compared to the weeks or months required to grow and analyze a culture. Sputum samples are collected in a safe, proprietary cup to keep contamination risk low. CIGHT’s tuberculosis test is on track to be the world’s breakthrough method for diagnosing active tuberculosis and could be ported onto a molecular platform such as Savanna. Many people with hepatitis C have immune systems strong enough to fight off the disease. At up to $1,000 per pill for 85 pills, the cure for hepatitis C is an expensive course of treatment that few can afford. It doesn’t make sense to put patients through this treatment if they can clear the illness on their own. CIGHT is pursuing both a molecular and core antigen approach for diagnosing chronic hepatitis C. A hepatitis C test could also be ported onto a molecular platform such as Savanna. Identifies candidates for life-saving hepatitis C treatment and weeds out those that have cleared the hepatitis C virus on their own. Confirms that the hepatitis C treatment has worked. With initial funding from the National Institutes for Health and the nonprofit FIND, CIGHT continues to work with corporate and nonprofit collaborators to develop a low-cost hepatitis C test.